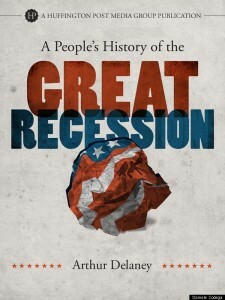 The book is part new material and part aggregated content taken from Delany’s work at Huffington Post since 2009 when he began specializing in recession based stories. Huffington Post isn’t however stopping at just one e-book, according to PaidContent, Aaron Belkin, Associate Professor of Political Science at San Francisco State University and founder and director of gay rights group The Palm will release another HuffPost e-book titled “How We Won: Progressive Lessons from the Repeal of ‘Don’t Ask, Do’t Tell.” Belkin’s book specifically focuses on repealing the military’s 17-year-old law for gay men and women serving in the military. In many ways the move makes sense for AOL Huffington Post Media Group since it allows them to create new revenue streams which are desperately needed as AOL has found it difficult to fill all of the company’s premium advertising spots. The move also makes sense as it shows readers that the online news organization has competent writers who are willing and able to share complex stories on a larger scale. If you’re a “blog for free” opponent don’t worry the writers are being compensated, not through advances for their efforts which would have been nice but rather through a revenue share program based on overall e-book sales, a fact that might draw more writers into the format should it be deemed a success. Personally I love the idea of creating a “snapshot” of stories that a certain writer has covered for Huffington Post, although I do find it a bit silly that the world’s largest aggregator is basically aggregating their own content, wrapping it up in a pretty bow, throwing in a bit more content and selling it to users for a second read. Will you be picking up any Huffington Post based e-books in the near future?